The St. Louis Cardinals made three trips to the World Series during the 1980's, winning their first appearance 4-games-to-3 over the Milwaukee Brewers in 1982, before falling to the Royals and Twins in 1985 and 1987, respectively, in dramatic fashion. 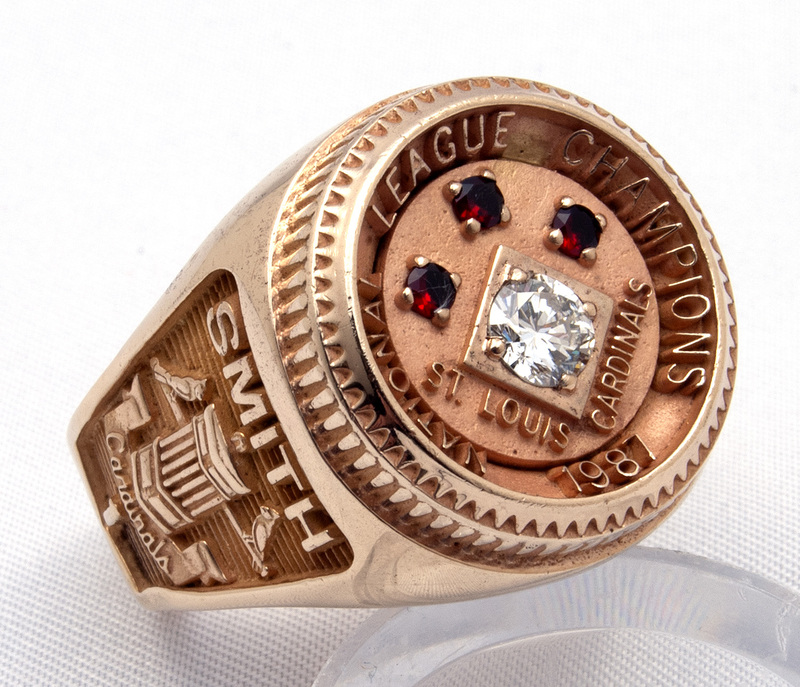 Front and center for St. Louis during this impressive stretch was shortstop extraordinaire Ozzie Smith (aka "The Wizard") whose dynamic, acrobatic defense earned him an unprecedented 13 consecutive Gold Gloves. 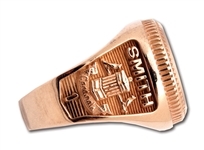 Despite hitting zero home runs during the 1987 season, Smith had his best offensive campaign by batting .303 with 182 hits, 104 runs scored and 75 RBI (all career highs) to finish as the National League MVP runner-up. 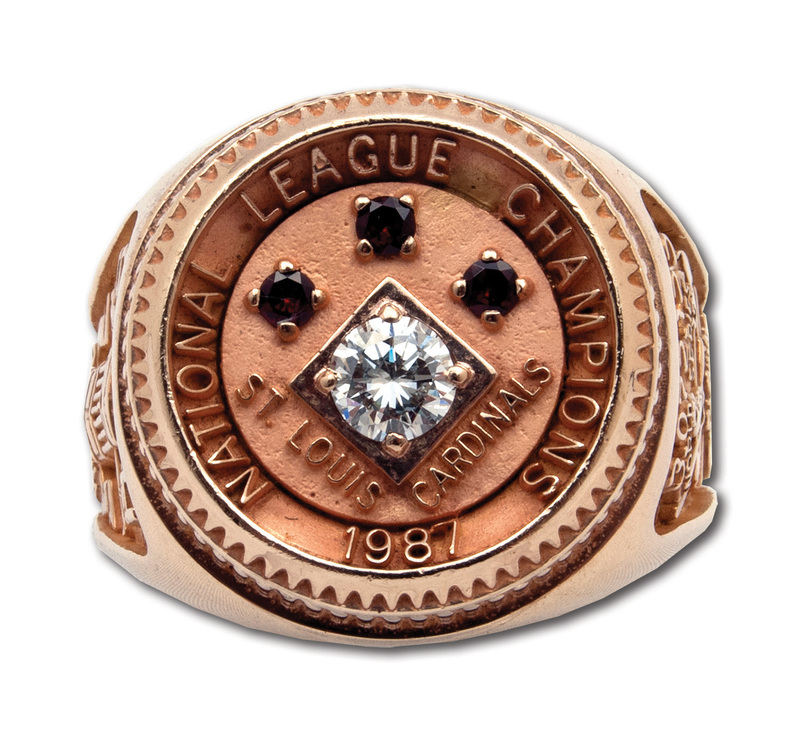 The '87 Cards won the NL East with a record of 95-67 before knocking off the Giants in the NLCS in a thrilling 7-game series. After going down 2-0 to Minnesota in the Fall Classic, the Redbirds rallied for three straight wins in front of their home faithful at Busch Stadium. 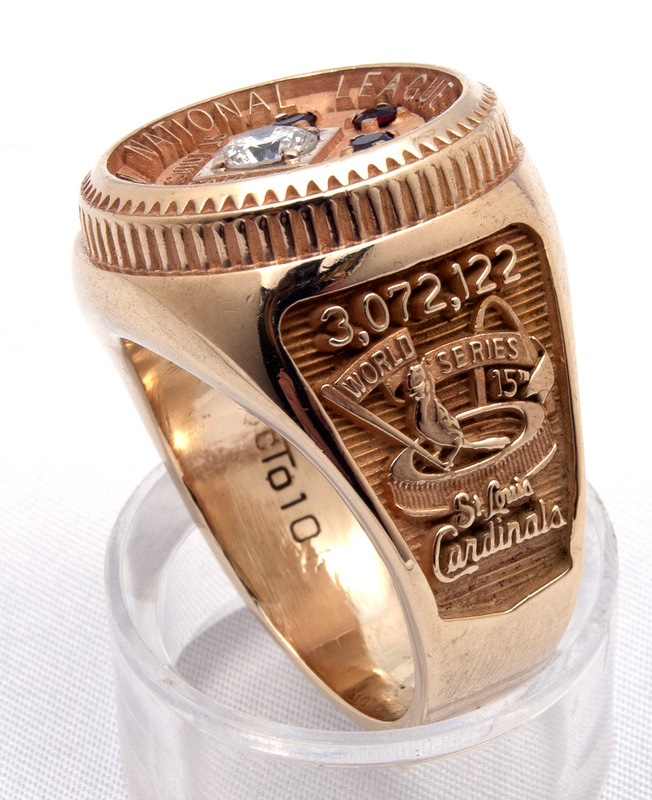 But the Twinkies regrouped and took the last two at the Metrodome to take the World Series in seven. 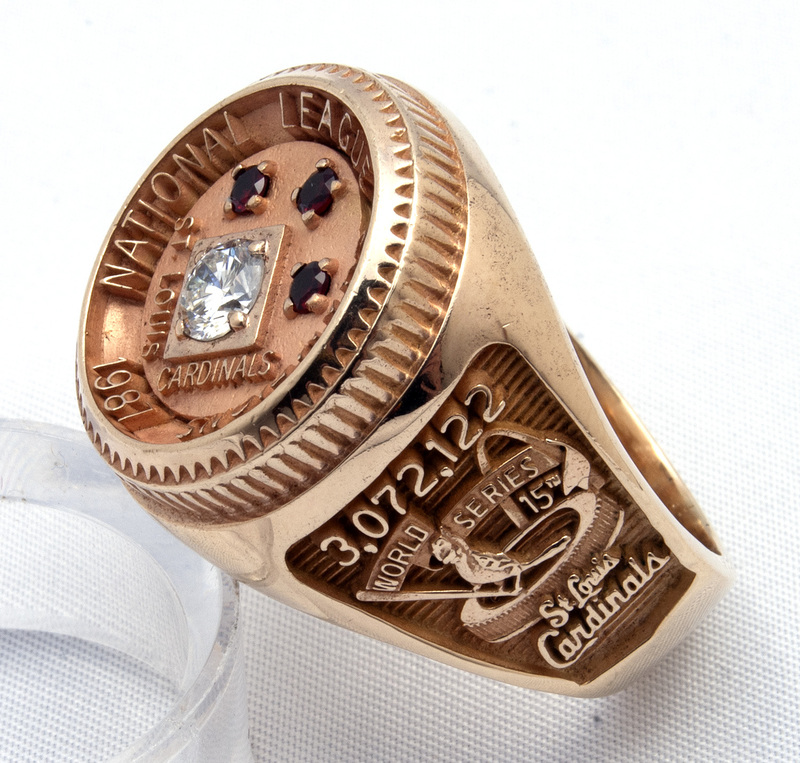 Offered here is Ozzie Smith's very own 10-karat gold ring commemorating his team's 1987 NL pennant. The face reads "1987 National League Champions" with a single real diamond plus three small red stones within "ST. LOUIS CARDINALS" in raised lettering design. 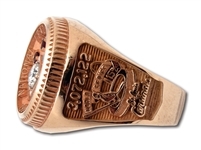 One shank includes a portrayal of Busch Stadium, the team's logo of a redbird holding a bat, the words "World Series 15" and "St. Louis Cardinals", plus the season attendance ("3,072,122"). 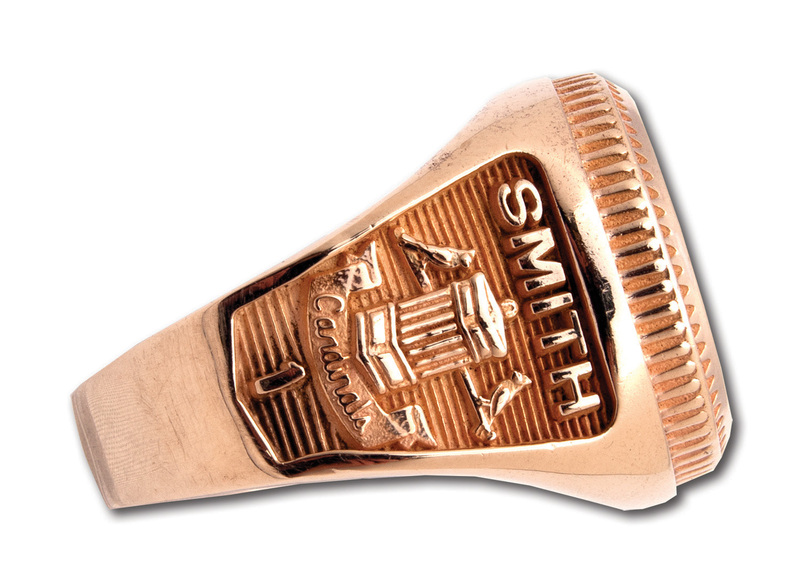 The other shank includes "SMITH," "Cardinals" and team logo and Ozzie's iconic uniform number "1" at the bottom. Engraved inside the band is "cTo 10K" (cTo = O.C. Tanner Jewelry Co., maker of the ring). 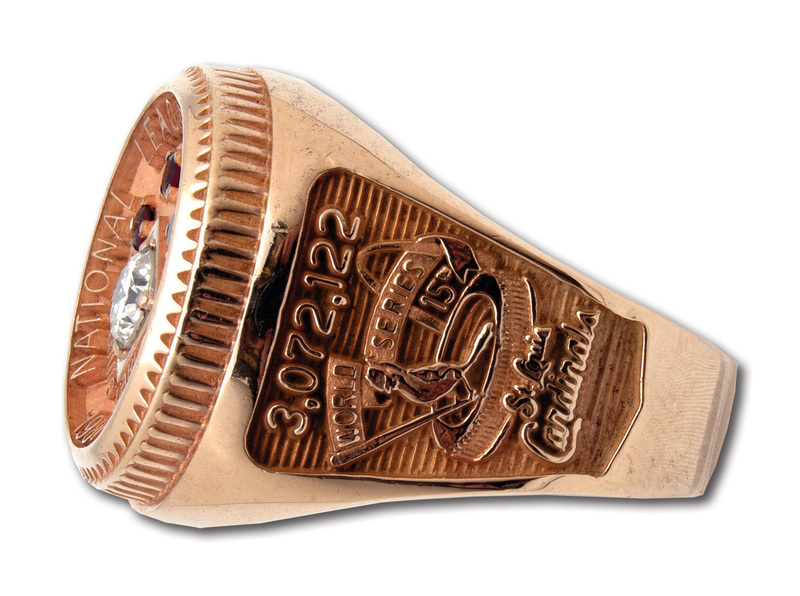 For whatever reason, team owner Anheuser "Gussie" Busch requested player rings be made of 10K instead of 14K gold. 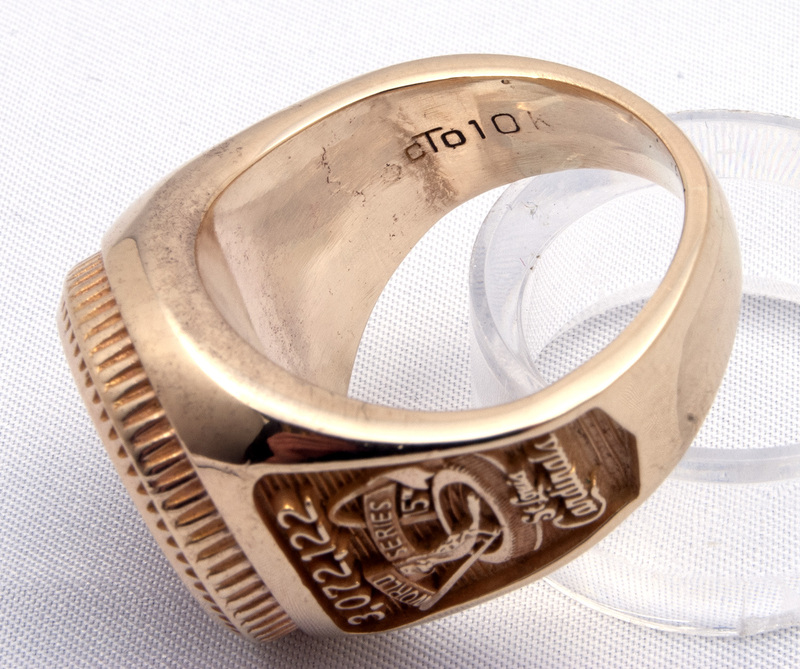 The size 12 ring weighs 40 grams and presents in tremendous shape with the only evident wear being on the interior. 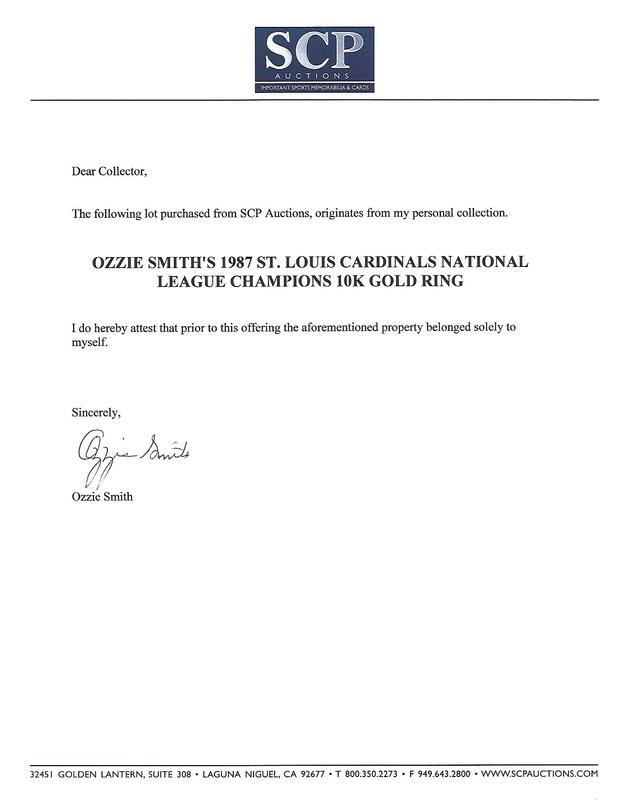 It comes directly from The Wizard's collection with an LOA signed by Ozzie Smith.